In 1922, Howard Carter shot to international fame when he discovered King Tutankhamun’s tomb and its legendary treasures. To coincide with the recent Tutankhamun exhibition in London, the Isle of Man issued a series of official commemorative coins – and, appropriately, the final coin honours Carter on the 70th Anniversary of his death. 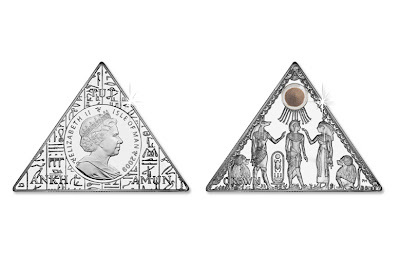 The coin is a stunning pyramid shape. It shows a design from the wall of Tutankhamun’s tomb, with Tutankhamun himself in the centre. The sun disc at the top contains ancient sand that was collected from the entrance of Tutankhamun’s tomb. Due to the coin’s unusual shape and the small amount of sand that was collected, the edition limits are exceptionally small. THE GOLD COIN HAS REACHED ITS ISSUE LIMIT. NO MORE GOLD COINS AVAILABLE. 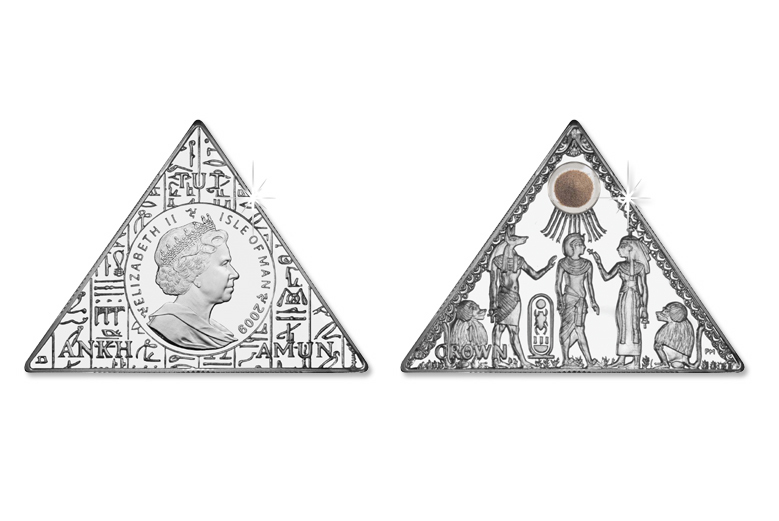 Each coin is presented in a specially commissioned, beautifully crafted Pyramid presentation case.